This member of the Jeffrey Ferris lineage took some digging. Much of what I had for him until yesterday was wrong, incorrect assumptions on my part. 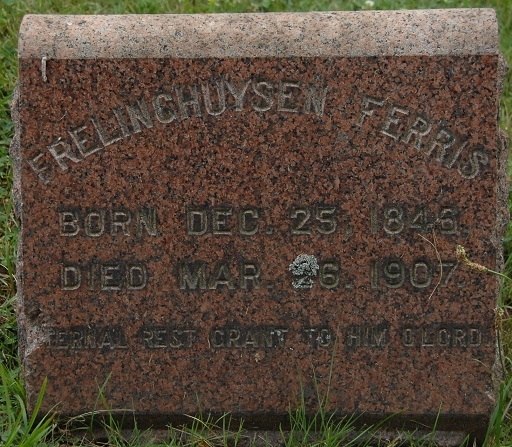 I am still fleshing out the data on his father and mother, but this is as accurate as I can be at this time for the Ferris with the most unusual first name. Parents: Abel Ferris, Jr. and Sarah Ford. Parents are as listed on information for the second wedding. Frelinghuysen Ferris, of Greenwich, obtained a divorce from his wife In the Superior Court In Bridgeport last Friday on the ground of Infidelity, and the custody of his two children, aged four and two years, respectively. 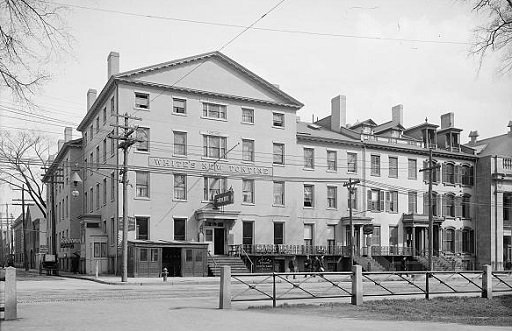 As soon as the divorce was granted, Mr. Ferris placed the papers in the hands of Sheriff Clarkson and went to New Haven to serve them on Mrs. Ferris, who was at the Tontine Hotel with her children. Mr. Ferris at once demanded the oldest child. On a plea of obtaining a change of clothing for the child, Mrs. Ferris opened a trunk, and after rummaging about in it for a few minutes brought out a revolver and defied her husband to take the child. Deputy Sheriff Pond, who had accompanied Sheriff Clarkton and Mr. Ferris to the hotel, seized Mrs. Ferris, and with the assistance of her husband disarmed her. Mr. Ferris took the child away. and Mrs. Ferris left the hotel soon after, threatening to procure another pistol and kill her husband—Jfc. 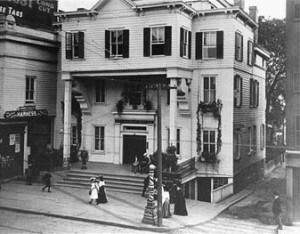 It appears, from the 1900 census, that Frelinghuysen and family were living at 177 Main St. in Stamford, which seems to be the address of the Stamford House Hotel. Greenwich Point is a town owned, 147 acre park facility that includes a beachfront on the Long Island Sound. The park area contains a number of ponds, a marina, a parking lot, open fields, a nature preserve, shelters, walkways and trails, and picnic areas with picnic tables. There also is a library book drop located on the beach. The only land access to Greenwich Point is over a narrow, broccoli stem shaped piece of land known as Tod’s Driftway (driftway), which is owned by the association, a private association of landowners who reside in the residential area adjacent to Greenwich Point. The town holds an easement over a private road on the driftway that provides the only means by which a person seeking to enter Greenwich Point by land may do so. The Greenwich Point area, the driftway and the surrounding area all originally were owned by Frelinghuysen Ferris. Ferris conveyed the Greenwich Point area to J. Kennedy Tod on March 30, 1892. Ferris later granted an easement over the driftway to Tod on October 17, 1892, while retaining title to the driftway and other land. The easement permitted Tod to construct a road over the driftway connecting Greenwich Point to the mainland highway and to use that road to access his property. Soon after Ferris granted the easement to Tod, Ferris transferred the driftway and surrounding areas in fee simple to Edwin J. Lucas. Those two areas became known as Lucas Point. After Tod’s completion of the road over the driftway around 1909, Tod and Lucas amended and reaffirmed the terms of Tod’s easement over the driftway. The boundaries of both properties, as set forth in a 1915 survey that listed the Greenwich Point parcel at approximately 147.21 acres, were the same as the boundaries currently in place.